A couple of Aphex Twin logos in London have fans speculating that a new album could be on the way. 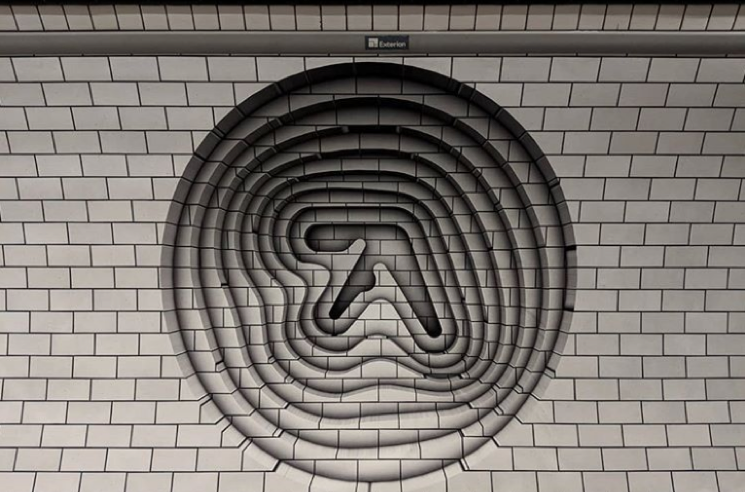 Two mural-sized graphics appeared in the Elephant & Castle tube station, prompting an observant Instagram user to share the image and fuel rumours that Richard D. James is about to release another Aphex Twin project. It's a fair assumption given that his past releases have been teased by equally cryptic viral marketing campaigns. Aphex Twins' 2014 album Syro was hinted at with a giant blimp, while his 2016 EP Cheetah was prefaced by mysterious mailouts. Stay tuned for further details if and when they become available. In the meantime, check out the latest Aphex Twin public art display below. UPDATE (8/3, 1:30 p.m. EDT): Many more mysterious Apex Twin logos have now popped up across the globe. This includes here in North America, where one has appeared on the side of Amoeba Music's flagship location in Hollywood. You can check out the latest sighting below. When did these Aphex Twin 3D graphics appear on the wall at Elephant and Castle tube? Not noticed them before. Something new coming from him? Aphex Twin Confirms 'Collapse' EP, Returns with "T69 Collapse"